Welcome To San Luis Rey Downs! 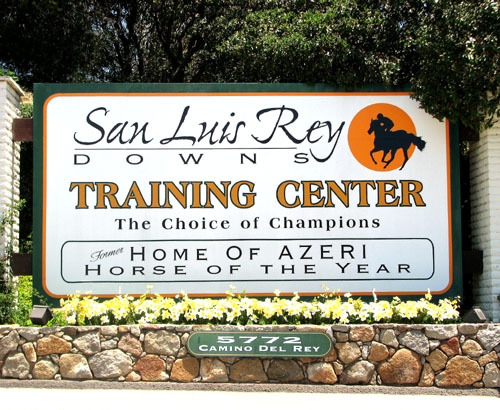 Located in Southern California, San Luis Rey Downs is the only auxiliary training track continuously approved by the California Horse Racing Board since 1984. This means that horses can ship from San Luis Rey Downs and run the same day. They are not required to be at the track 24 hours ahead of their races. Unlike the tracks in the California racing circuit, San Luis Rey Downs is open for training every day, 365 days a year, enabling trainers to develop a permanent home. San Luis Rey Downs is a private facility that rents space to approved horsemen. Trainers stabled there are independent contractors who welcome new clients. For a list of San Luis Rey Downs trainers and contact information, click here. There are currently 500 stalls at San Luis Rey Downs, leased by trainers wishing to have a permanent base for their training and racing operations. Amenities at San Luis Rey Downs include a large regulation-sized equine pool, arena, round pens, stationary training gate, “All Weather Trails,” tack shop/feed store, Equicise (free run) machines, saddling paddock, track kitchen, mechanical hotwalkers, an equine scale, Farrier Shop, pens and outside paddocks. To request a short CD of San Luis Rey Downs, click here. For a pictorial visit to San Luis Rey Downs, click here. 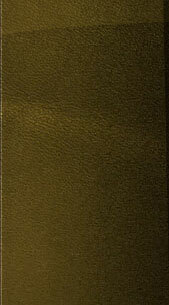 For an aerial photo of San Luis Rey Downs in 1982, click here. Many of the breeders in Central and Southern California use San Luis Rey Downs for the transition between the baby training done on the farms and the high-powered racing of Southern California. One has only to look at the partial list of champions and stakes horses who have called San Luis Rey Downs home to see the quality of horses who have lived in these stalls and galloped on the track over the years. Stall space is at a premium at the racing meets. 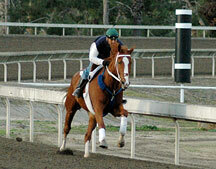 Very few trainers are able to keep stalls at Santa Anita and Hollywood Park for horses that are not racing regularly. For this reason, more and more trainers are opting for the clean air and quieter atmosphere of San Luis Rey Downs, where they can have all their horses together. It's not unusual to see yearlings going to the track with older horses, especially in the fall of the year. 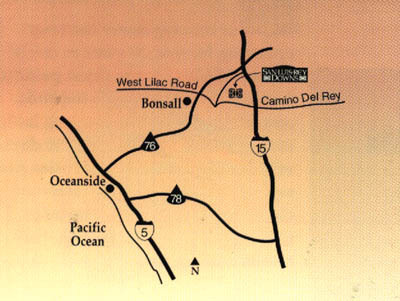 San Luis Rey Downs, in the affluent bedroom community of Bonsall, in northern San Diego County, is easy to find. Here's a map showing just where it is. Schools in the area are of high quality and the community of Bonsall welcomes the agricultural aspects of the training facility. An expansion of Highway 76 from Highway 5 to Highway 15 is nearing completion. This will greatly reduce travel time to and from the racing tracks. Because the people working at San Luis Rey Downs are based here year round, they have lost the gypsy aspect of the horse racing business. Many of them own homes in the area and have become active in their children's schools, the churches, and the community. Many outstanding horses, including Azeri, Cigar, Sunday Silence, and Fusaichi Pegasus, have left their footprints on the San Luis Rey Downs track. For a partial list, click here. Four Kentucky Derby winners have begun their early training at the facility (Fusaichi Pegasus, Sunday Silence, Gato Del Sol and Ferdinand). And for the recent past, there have been several graded stakes winners, including Horse of the Year Azeri, shipping out to race and returning to their familiar SLRD stalls at night. For photos of the trails, click here. On the southeast end of the facility, overlooking the seven west-facing barns, a trail system has been developed and is available as a further alternative to the daily grind of galloping horses around the track. The trails are about 20 feet wide, bordered on the ground by the old wooden track rail with a new white paint job. 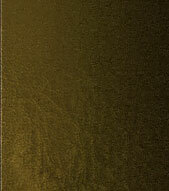 The surface is covered to a depth of about six to eight inches with wood chip shavings and packed tightly. The horses literally bounce over the ground like a kid in a new pair of tennis shoes! The trails are rolling with a fairly good grade in some places, giving the horses plenty of exercise as they jog or gallop up and down the slopes. Trainers find that older, track sour-horses develop renewed interest in their morning exercise when they are pointed toward the trails. The hope is the reduced concussion will prolong the resiliency of the horses' joints by reducing the arthritis so common in athletes that train on the same hard surface on a daily basis. The base of the trail slopes so as to cause good drainage during rains. This means the trails do not get muddy or slippery and are able to be used during the rainy season when the track is sealed and thus is very hard. Because of this the trails are referred to as "All Weather Trails."